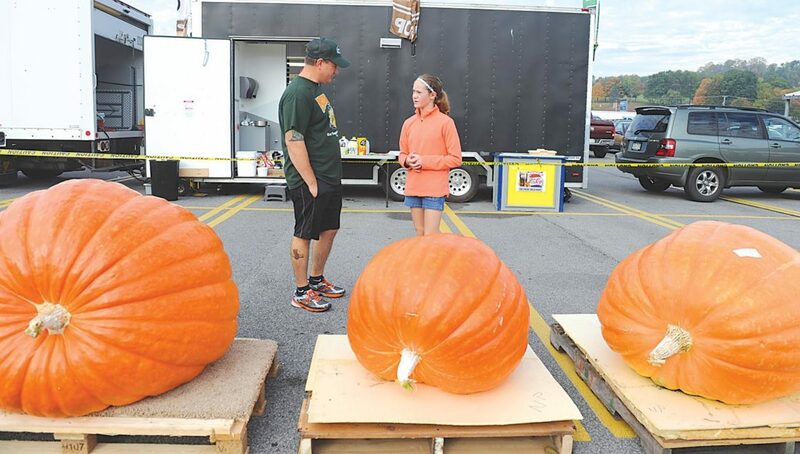 Mirror photo by Gary M. Baranec / Jay Yohe and his daughter, Nicole, of Export look over entries at the annual Pennsylvania Giant Pumpkin Growers Association weigh-off in the Sam’s Club parking lot Saturday. This year’s winning pumpkin, grown by Quinn Werner of Saegertown, Crawford County, weighed 1,676 pounds. If they were jack-o-lanterns, they’d be the stuff of nightmares — discolored, misshapen and huge. The biggest ever weighed 2,624 pounds — more than a ton and a quarter. They are great pumpkins, and on Saturday, there were lots of them in the Sam’s Club parking lot, to which they are hauled from across the state on trailers and trucks for the annual Pennsylvania Giant Pumpkin Growers Association weigh-off on the first Saturday of October. This year’s winning pumpkin, grown by Quinn Werner of Saegertown, Crawford County, weighed 1,676 pounds, far less than the world record set by a German grower and considerably less than Werner’s own Pennsylvania record of 2,020 pounds — but still more than three-quarters of a ton. These are not pumpkins for setting out on the porch at Halloween. These are like bodybuilders on steroids, fit for the stage. A couple of Werner’s have been dropped on junk cars at a fall festival for the entertainment of onlookers. He douses his pumpkins with insecticide and fungicide once a week and drenches the roots with chemicals to combat rot every three weeks. He begins with the best DNA he can find in the form of seeds from victorious pumpkins, as ascertained through internet research during the winter, he said. He planted the pumpkin that took the $1,500 prize in Altoona on April 23, along with nine other pumpkin vines, and proceeded to water them all summer at the rate of 120 gallons a day — per plant. At their peak, they took on 40 pounds a day, he said. Each one. He began growing 20 years ago, on a bet with a friend over who could grow the biggest. Still, he prevailed, and the friend still owes him a steak dinner. As of Saturday, he had three pumpkins in his garden bigger than the one that took the Altoona contest. One was headed today to a weigh-off in Columbus, Ohio, and the other is destined for a weigh-off in Canfield, Ohio, next weekend, he said. Paul Smarsh of Northern Cambria also competed in Altoona on Saturday. His pumpkin weighed 583 pounds. “A bad year for growing,” he said. He had a heavier one, but a groundhog mangled it last week, he said. Last year, he brought a pumpkin that weighed 723 pounds. And he’s learning, after approximately seven years in the game. But he won’t go to the lengths of someone like Werner. “I ain’t got the time,” he said cheerfully. Ted Cope of Connellsville took fourth place Saturday with a 1,254-pound pumpkin. It’s his heaviest, after six years of trying. But Cope’s main focus is the camaraderie and cooperation. 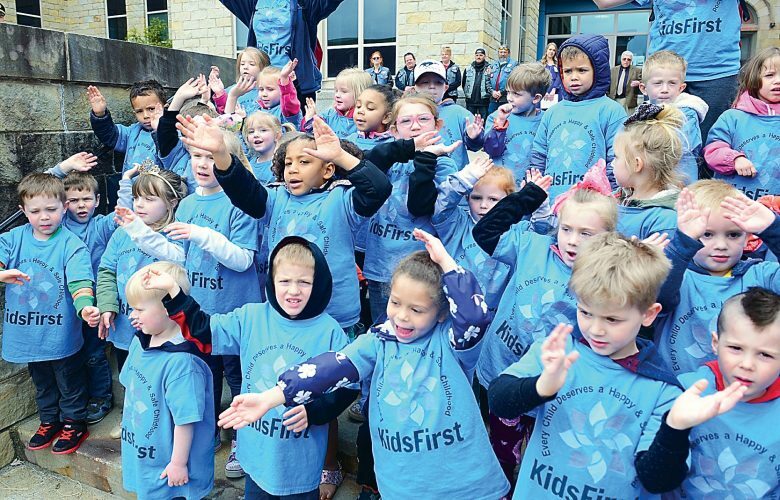 Contestants compete, but they also cooperate and show kindness, he said. “Someone will have a seed you want real bad,” he said. It will be available at auction, but at a price you can’t afford, he said. Then the owner will simply give the seed to you, he said. Growers of giant pumpkins are also generous with tips, he said. He’s determined to pass on such a spirit, he said.